The collection of massive observational datasets has led to unprecedented opportunities for causal inference, such as using electronic health records to identify risk factors for disease. However, our ability to understand these complex data sets has not grown the same pace as our ability to collect them. While causal inference has traditionally focused on pairwise relationships between variables, biological systems are highly complex and knowing when events may happen is often as important as knowing whether they will. 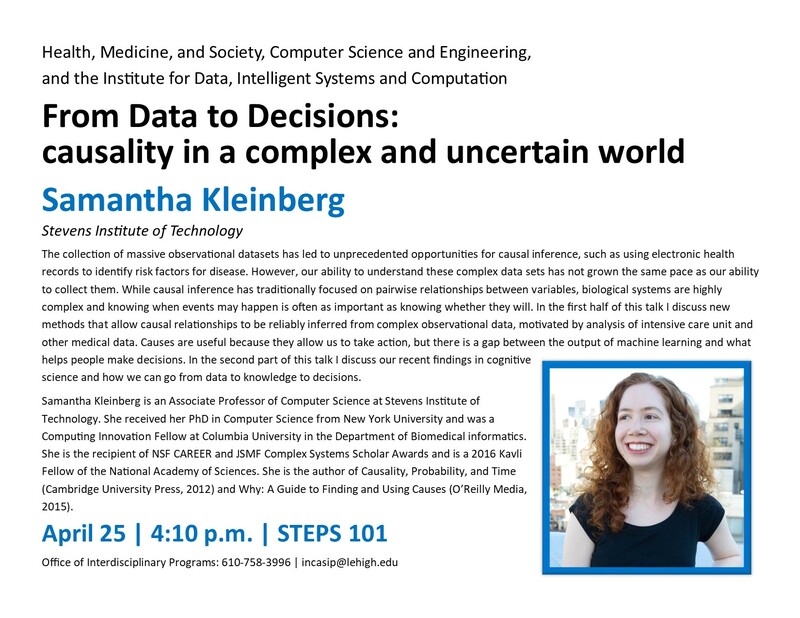 In the first half of this talk I discuss new methods that allow causal relationships to be reliably inferred from complex observational data, motivated by analysis of intensive care unit and other medical data. Causes are useful because they allow us to take action, but there is a gap between the output of machine learning and what helps people make decisions. In the second part of this talk I discuss our recent findings in cognitive science and how we can go from data to knowledge to decisions. Samantha Kleinberg is an Associate Professor of Computer Science at Stevens Institute of Technology. She received her PhD in Computer Science from New York University and was a Computing Innovation Fellow at Columbia University in the Department of Biomedical informatics. She is the recipient of NSF CAREER and JSMF Complex Systems Scholar Awards and is a 2016 Kavli Fellow of the National Academy of Sciences. She is the author of Causality, Probability, and Time (Cambridge University Press, 2012) and Why: A Guide to Finding and Using Causes (O’Reilly Media, 2015). Click Here for archived events.